In the first two posts in this series we covered the basics of starting a WebSphere Liberty on IBM Containers via the browser and then using the command line to deploy an application. We’ve already seen some of the value-add that comes out of the box when running under IBM Containers. For example, at no point have we needed to be concerned with the underlying infrastructure on which the containers are running (beyond selecting a region). When we created an image it was scanned automatically for vulnerabilities. Each container was allocated its own private IP address accessible from any other container running in the same space – no need to set up and configure overlay networking here. We had control over whether we also wanted to assign a public IP and, if so, what ports should be exposed there. We also had easy access to metrics and standard out/error from the container. So far we’ve only deployed a single container though. What happens when we hit the big time and need to scale up our application to meet demand? When we created our first container via the UI, you may remember that the Single option was selected at the top. Let’s go back and try out the Scalable alternative. 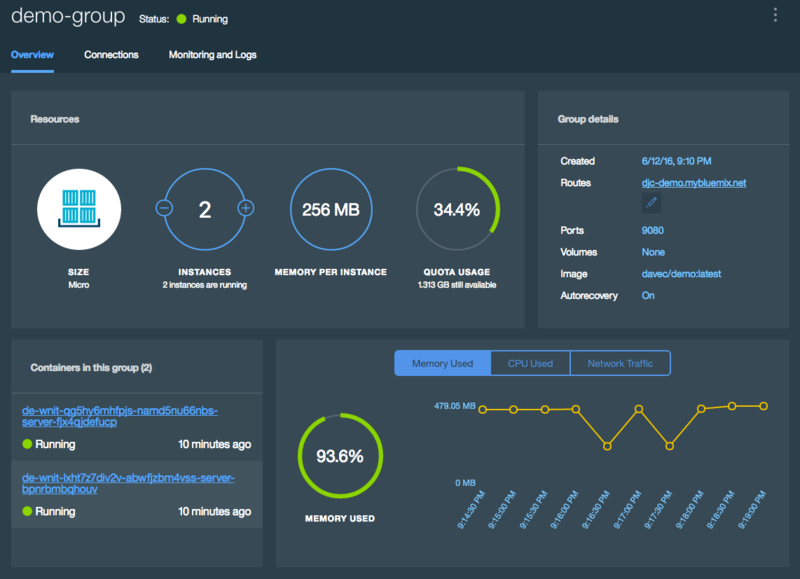 From the catalog, navigate through Compute and Containers (remember that these instructions are based on the new Bluemix console). Select our existing demo image. Next, select the Scalable button at the top and give the container group a name. By default you’ll see that our group will contain two instances. 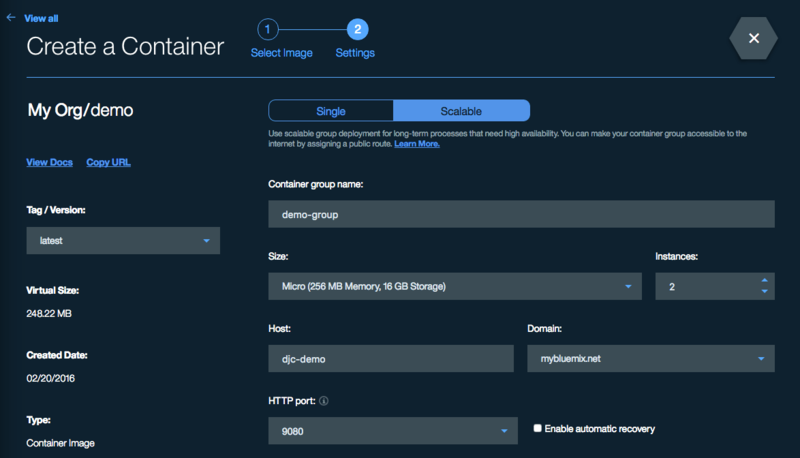 Rather than having a single IP associated with a container, this time we are asked to give a host name (on the mybluemix.net domain by default) for the group. Requests arriving at this host name will be load-balanced across the container instances in the group (reusing the gorouter from Cloud Foundry). One nice bonus of this approach is that it doesn’t eat in to our quota of public IPs! As the host name needs to be unique within the domain, I tend to include my initials as you’ll see in the screenshot below. Select 9080 as the HTTP port and then click Create. Right-click on the route shown in the Group details section and open it in a new tab. This should take you to a Liberty welcome page and, if you add the myLibertyApp context root, you should be able to see the application again. If you hit refresh a few times, although you won’t be able to tell with this application, your requests will be load-balanced across the two instances. If you return to the dashboard and switch to the Monitoring and Logs tab you can switch between the output for the instances and should, for example, be able to see the spike in network usage on the two containers when you made the requests. If you return to the Overview tab you will see that there are plus and minus symbols either side of the current number of instances. These can be used to manually scale the number of instances. Click the + icon, click Save, and watch the creation of a new container in the group. Manual scaling is all very well but it would be better if the number of instances scaled automatically up and down as required. If you’re deploying your containers in the London region then you’ll notice an extra tab at the top of the dashboard labelled Auto-Scaling. It’s only available in the London region at the moment because the service is still in beta (and so things may change a bit from what I’m describing here). Having selected this tab, click the plus icon labelled Create policy. Give the policy a name default and set the minimum and maximum instance values to 1 and 3. Add two CPU usage rules to scale up and down the number of instances as shown in the following diagram and then hit Create. Finally, select Attach to activate the policy for this scaling group. If you click the Auto-Scaling History tab you should see that a scaling action has taken place. We originally scaled up manually to 3 instances but, as the CPU usage is below our 60% limit, the number gets scaled down by one. If you wait another 5 minutes (the cool down period we specified), then you’ll see it get scaled down again to our minimum of 1. 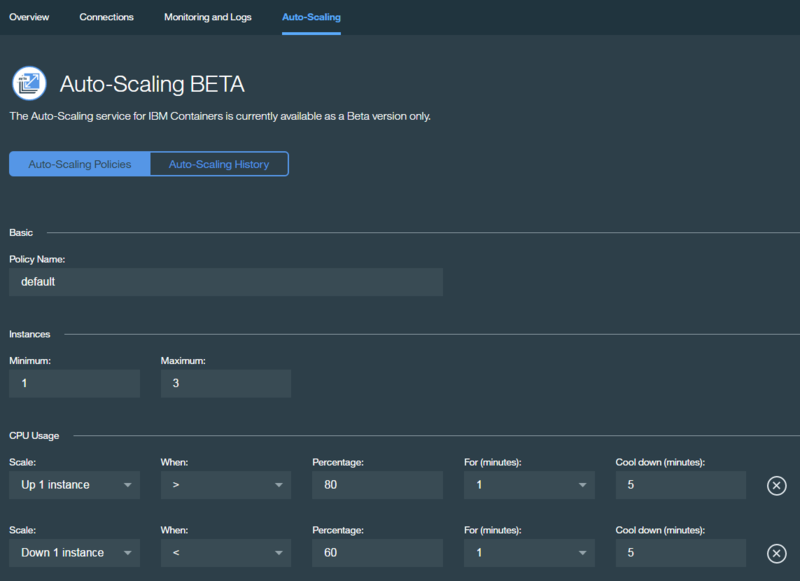 And that concludes our tour of the scaling options in IBM Containers! This entry was posted on Saturday, June 18th, 2016 at 3:14 am	and is filed under Docker, WebSphere Application Server, Work. You can follow any responses to this entry through the RSS 2.0 feed. Both comments and pings are currently closed.